It is both a great honor, and very great pleasure, to present my works of art at Google Headquarters. I hope this exhibition will further spark the deep imagination and creativity that Google employees bring to citizens of the Earth projects and work that are revolutionizing how we live and how we understand the world.My paintings invite you to a poetic exploration of the territories that lie at the edges of the infinitely small and the infinitely large these are links we have with the micro and macro ecosystems that comprise our environment. These representations are often constituents and carriers of our perceptions of the world, inspiring our cosmogonic visions, influencing human activities and cultures, and thus illustrating our relationships with both our environment and our fellow humans. By looking at the past, we gain a better understanding of the present. Then we can project our- selves more lucidly into the future. During my first visit to Google Mountain View, and meeting with people who work on projects like Google Maps and Street View, I observed an esoteric pattern language embedded within the languages of code. This stimulated me to draw a parallel with the art work of the Aborigines of Australia, who as far back as 45,000 years BCE represented their territories and environment by their works of art. The vision of the early Aborigines was both to map the lands on which they lived, and by use of symbol, also illustrate the main relationships that comprised their environment: « ora, fauna, water, light, mountain, desert, sky and stars. 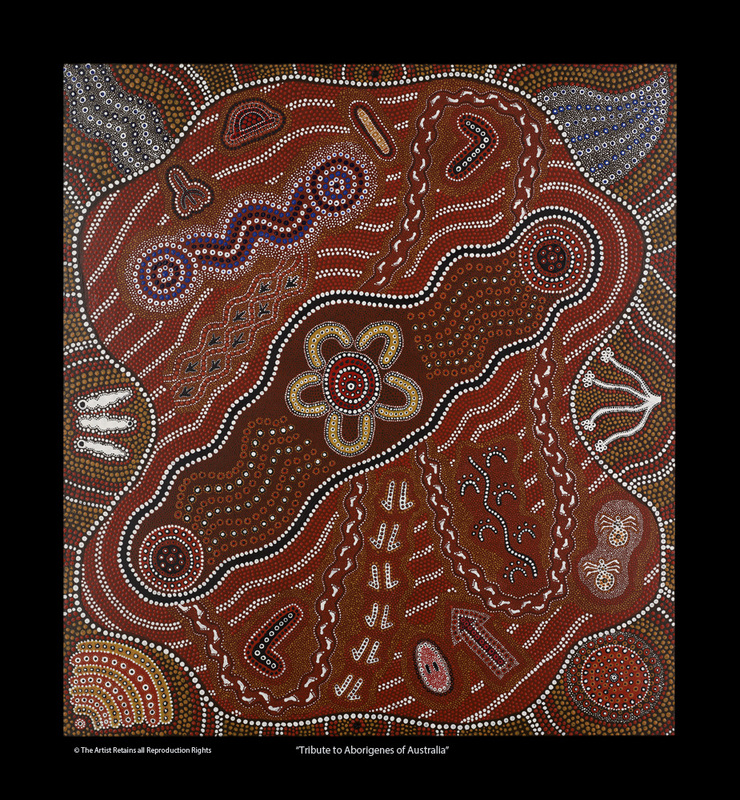 Aboriginal art also illustrated social organization, tribal migrations and celebrations, hunting, gathering and fishing to sustain life, and human relationships to the environment. Aboriginal art work also had spiritual dimensions that represented sacred rites, myths and places art forms that preserved and protected the secret traditions of those few who were initiated. By mapping both their material and spiritual dimensions, the Australian Aborigines represent- ed their world holistically, rather than in its component and reductive aspects.The question you’re probably asking now: apart from technology, what are the parallels and what are the differences between the work of Aboriginal artists of 45,000 years ago and the work of Google employees in the 21st century? The major differences, of course, are the scope and scale of closed and open systems. While the early Australians had primarily territorial perspectives, present day «Googlers» have planetary and cosmic perspectives. Yet: from the fractal form, where self-similarity exists at all scales, the modus vivendi and impetus between then and now is strikingly similar: to identify, to lo- cate, to demonstrate relationships between points, to meet, to communicate, to survive, thrive and understand. And while the sacred and spiritual dimensions of Aboriginal art originated in the primitive ideas of recording, preserving and enclosing a worldview (their own), a case can be made that there is an opposite, but also sacred and spiritual dimension to Google work: collecting, re- cording and making information available to all thus greatly expanding the ways we all can look at the world. Silicon Valley has been the incubus and matrix for most advanced technologies travel in space, satellite communications, semiconductors, digital technologies, and now the ubiquitous Internet. Through Google tools, we have become much more aware of the beauty and majesty of our planet and cosmos. At the same time we can observe the fragility of our orbiting sphere with our own eyes on lap- top, tablet and smart phone screens. Thus we gain a greater appreciation of Earth as a system of systems infinitely complex, non- linear, and ultimately exquisite in its order and disorder. This ontology represents an increasing level of planetary consciousness in which we all are participating. Historically, technologies were developed for «instrumental» useful and gainful purposes from the creative imaginations of cultures, and later from individual inventors: the use of !re, the wheel, alphabets, writing and numerical systems, electricity, the steam engine, machines, automobiles, telephone, television, computers, smart phones, and so on. Today’s world is one of intensive creativity, rapid innovation and change. Anthropologists and sociologists who study ancient and indigenous cultures use the term «Technologies of the Sacred» to describe the various art forms, practices, rituals and myths that those cultures recorded and preserved. A point can be made that modern advanced technologies also are Technologies of the Sacred, for they have opened our eyes, minds and spirits to the world and the cosmos as never before, and have given us new pathways for gaining real wisdom. Our imaginations and creativity have been inspired as never before, both in the communities of artists, scientists, engineers, technicians and practitioners of sacred traditions. The dilemma and the challenge now is to expand this imaginative, creative and productive impetus of «open systems» to the day-to-day dimensions of cultural, economic, political and social life to teach people how to apply and use these creative tools to enlarge and enrich more broadly the worldviews of people worldwide. The reductionist paradigm with its roots in the Enlightenment contributed greatly to the advancement of knowledge. But now it is proving deficient in explaining and teaching how the infinite complexity of our interconnected world operates and can be understood. The contributions of Google, in providing much greater access to information and knowledge, and more vast and holistic views of our complex world, is increasing our planetary conscious- ness and enhancing the robust diversity of our social and ecological systems. Perhaps our advanced information and other technologies, broadly speaking , will be viewed by future anthropologists and social scientists also as a Technologies of the Sacred. A better understanding of complexity depends on the ability to have dialogues that are both horizontal and transdisciplinary. My pictorial concept «Fractal Syncretism» is a proposition that contributes to a better understanding that the Arts collectively share underlying commonalities with the Sciences and Sacred Traditions. Despite their different languages and criteria for truth, each is an expression of the creative dynamics and mysteries of creation.Please enjoy this poetic and pictorial journey into my fractal and nonlinear world: its a journey into nature and into ourselves. 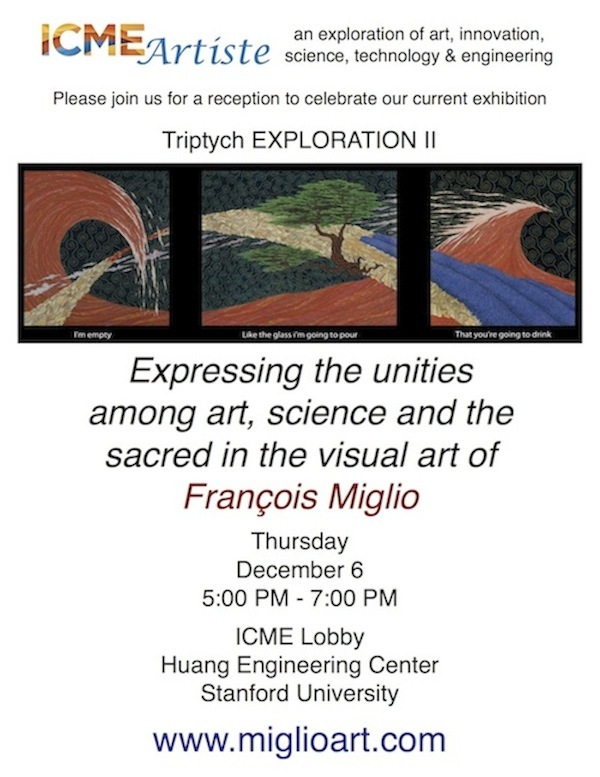 Thanks to all of you for being here this evening, and to ICME, Margot, Nick and all the students who welcome this exhibition. Science, Technology, Engineering and Art encounters: what’s a great idea that Margot and ICME propose through this exhibition program. At this particular moment of our history, when humanity has to confront, not just a crisis but a major bifurcation, it’s important to understand what is complexity is. I have proposed the concept of « Fractal Syncretism » in which my visual art explores the infinite complexity and unity of nature through fractal representation and non linear world. Fractal Syncretism is the proposition that art collectively shares underlying communalities with science and the sacred . Because the Fractal world is a landscape [into] within the landscape, a series of ubiquitous forms in nature, it always has been seen and represented by humans. But the fractal world is not only a pattern that shapes nature, it’s also dynamic structures that explain a number of behaviours, a link between Order and Chaos. Because humans are part of nature and subject by the same laws, they express spontaneously this fractal dimension in every civilisations, cultures, any activities at any ages. Why would computational activities make an exception ? I am convinced , like Stanford University, which created many Interdisciplinary Academic Programs, that a better understanding of complexity depends on the ability to have dialogues that are both horizontal and trandisciplinary. Enjoy this poetic and pictorial journey into this fractal and non linear world : Its a journey into nature, it’s a journey in ourselves.